Imagine that each island in Hawaii is pie-shaped, with a mountain rising in the center. Now imagine slicing that pie into wedges. That’s how the ancient Hawaiians divided their land. Each pie shaped slice is called an ahupua’a (kind of sounds like “ah-who-pooh-ah-ah” with nearly equal emphasis on all syllables). This ahupua’a system was very practical and took into account the ecosystem and the flow of water from the mountain to the sea. 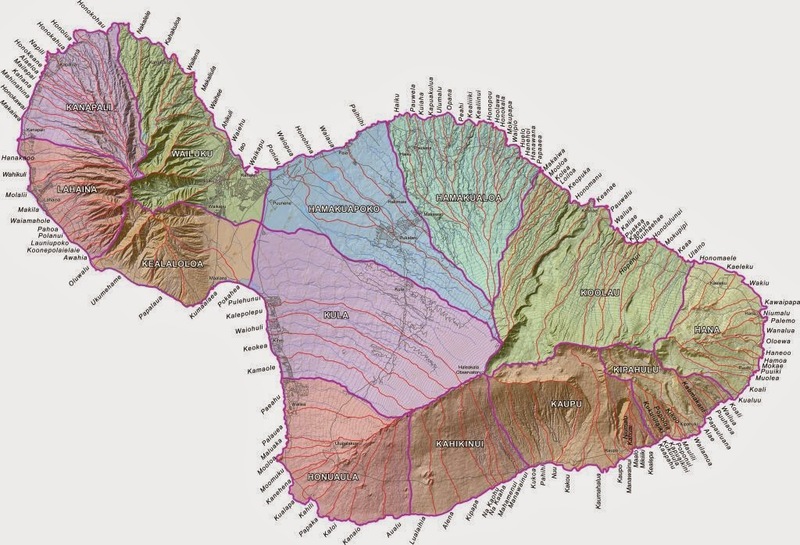 This map shows the ahupua'a divisions on Maui. Map is courtesy of islandbreath.org c. 2011. Everyone who lived in that ahupua’a could use what was in that ahupua’a and there were rules to prevent misuse. If the people of that ahupua’a did not have something, they could trade with people of another ahupua’a. One more step. Think about where you live. Imagine there are no state or national boundaries. Instead the land is divided so that each division contains as much natural variety as possible from the highest to lowest elevation. So if you’re in Colorado, maybe you would be in a long wedge that goes from the Rockies, cuts through Arizona and New Mexico and goes down to Baja. As a resident, you have access to all the natural resources of that wedge. If you’re in Switzerland, you might live in a wedge that goes from the Alps to the coast of Italy. There are no groups that control the entire coast line or all the resources in the mountains. The responsibilities and joys of the connected ecosystems are shared by all the residents. An ahupua’a might not be practical on such a large scale, but it’s interesting to speculate on how our lives might be different if we lived in one. P.S. If you are blog hopping from the A to Z challenge, please include your link if you comment! I try to reciprocate comments as quickly as I can, though I did get behind last year. How have we moved so far away from living in harmony with nature...the ancients seeemed to have had far more sense than we do nowadays. Good post, thanks. Fascinating! But it's such a fair way of sharing natural resources, which (even now) can be the source of many disputes. Thanks Tui! Thanks for retweets too! Good luck w/ A-Z Challenge this year! Aloha Maggie, Mahalo (Thank you ) for stopping by. I look forward to checking out your blog. So lovely to find you again on the A-Z.. I remember your delightful posts from last year! It would be so wonderful if there were no barriers between peoples and countries .. imagine, all being a part of the ecosystem. Very interesting...I never knew that about the land division. Aloha Susan, nice to see you again this year. Thanks for taking the time to stop by. It's something that isn't widely known, but it's important in Hawaiian culture. Great post Courtney! And as a map lover, I love the map you've shared. There are so many place names on Maui that go back to this ancient system, and many others that have been lost. It's fun to take a look and see what I recognize and what I've never heard of. Mahalo! Malia, thanks for commenting. I appreciate your perspectives esp. because you know the island so well. Great, mahalo for stopping by. I appreciate you leaving the link so I can find you easily. That's a nifty (and practical) way to divide land and resources. Thank you for sharing this bit of Hawaiian History! Learning something new everyday. Mahalo for including your link!